When we arrived at the Khan Al-Khalili, my main mission was to find the shop. I asked a street vendor if he knew where it was and he offered to take my wife and I there. I didn’t really think that he would bring us to the shop but after a few pit-stops at some of his “cousins” shops (yes they did try like crazy to sell us anything they could) we arrived at the tarboosh shop. The shop was quiet asides from a few employees. They were all very friendly and happy to see us. They showed us all different versions/ colors of the tarboosh and explained the process of how they are made. The hats are shaped on heavy brass presses which you see upon entering the shop. 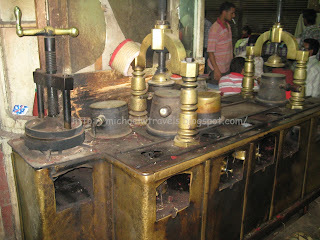 I was wondering if the presses were as old as the shop which has been in business for over 150 years. The hats are all handmade and it was very interesting to hear about the process used to make them. The tarboosh is made from felt and lined with a straw-like material. They seem to be a pretty time consuming item to make and I was worried that they might be a bit too pricey for me to add to my collection. Trying on the felt before it is formed on the press to become a tarboosh. I spoke a bit with the shop’s owner and haggled with him for a better price. I can’t recall exactly what I paid, but I think it was in the $20-30 range. 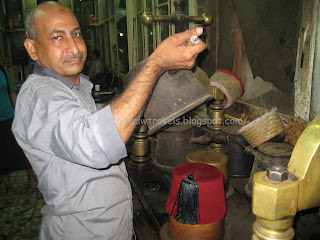 I think it was a fair price to pay to get an authentic hat from the last tarboosh maker in Cairo! 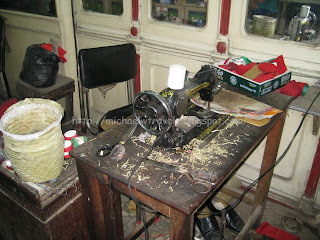 The shop looks like something from an Indian Jones movie. What a cool, one of a kind experience! I was there last March (after the Revolution). The SAME guy in your picture made my Fez hat! Cool. I paid 100 Egyptian pounds (about $18). Very cool!! Impressed with your photos. We are from the US, Oregon. We were there in April, 2012. Got there early and watched as a man washed the store by pouring about a quart or two of water onto the floor and sweeping it out onto the large dirt pathway outside. 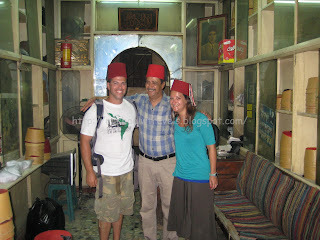 The owner soon emerged and was ready for business–we also got a Fez for 100 Egyptian pounds. The store really was amazing to visit! I envy you and your wife (not in a bad way). In April 2008 my wife and I spent a few days in Cairo and while we were there I bought a “fez”. It looks great but on closer examination you can see its tourist quality and not made by traditional methods or with traditional materials. Hmmmm, think i’ll write to this chap and see if he is still in business as that does indeed look like a real fez. Thanks for posting the blob. 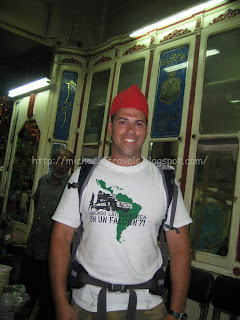 I have always wanted a fez (or tarboosh) and always figured I would just pick one up in any old shop in any old North African country. Now I know I can never have peace until I have a tarboosh from this very shop in Cairo. Coup or no I am going to Egypt to buy this hat! No joy….me thinks this chap is currently out for lunch. Two letter and no reply. Do you know which 3 days a week he works? I was recently in Cairo with my family. While my wife and mother shopped in khan el khaleili, me and my son managed to reach the shop. We took directions from a number of shopkeepers. They all seemed to know the ‘ Tarboosh Shop’ in al ghauriya st, so i assume it was the same shop as in the picture. 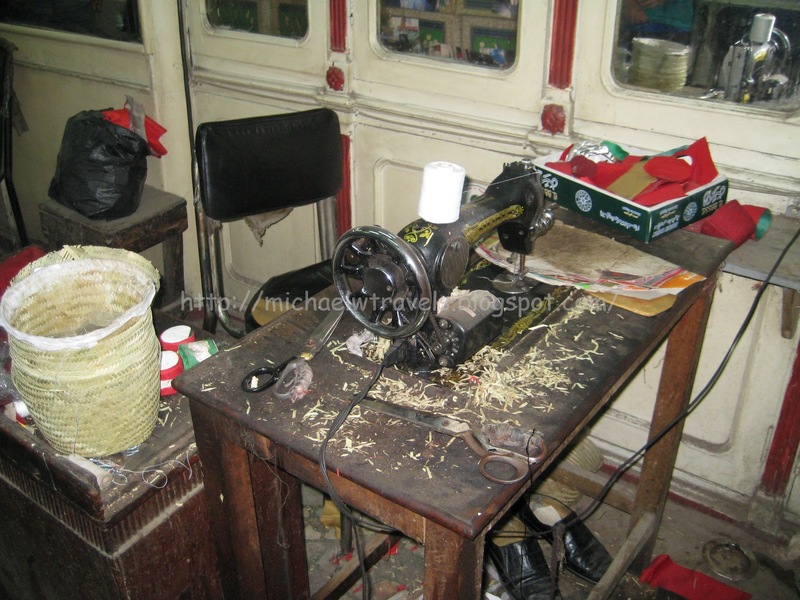 The owner was an elderly gentleman called Hassan. I bought one maroon cap for myself and a red one for my son. He referred as best quality to the maroon one and asked for 300 Egyptian pounds and referrred as second quality to the red one and quoted 90 pounds for that. In the end we paid 350 for both which amounts to around 45 US dollars. Indeed it was a treat to visit this shop. Had always wanted to own a tarboosh, but getting down to procure one this way, was quite an experiance. The second quality seems as well made as the best quality, the main difference seems to be quality of the cloth.